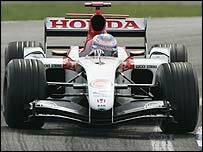 Honda has completed a deal with British American Tobacco to make it a joint owner of the BAR Formula One team. The agreement to give Honda a 45% stake in BAR was put in place in November but complications over the role of minor shareholders caused delays. Former team boss Craig Pollock was one of three smallholders whose permission was needed to complete the sale. He refused to co-operate and BAT put the team's holding company BAR Holdings into administration to force his hand. The remaining 10% of BAR Holdings has now been acquired by BAT, enabling it to sell a 45% stake to engine suppliers Honda. "BAR Holdings Limited, the new 55/45 joint venture between British American Tobacco and Honda Motor Company, has completed the acquisition of the BAR Formula One racing team from administrators Grant Thornton," a BAR statement said. Honda has supplied engines to BAR since 2000 but the Japanese company is stepping up its involvement with the team, which is based at Brackley in Northamptonshire. Construction has already begun on a new £100m wind tunnel. As part of the shake-up at BAR, it was announced that team boss David Richards would leave at the end of 2004. The buy-in is expected to be the first step in a takeover by Honda, with BAT likely to pull out of Formula One when regulations banning tobacco advertising come into force. BAR will again have Jenson Button and Takuma Sato driving for them nextseason.